Prospects and amateur scouting are a new frontier within hockey analytics. Numbers can highlight some large market inefficiencies exploitable by teams if and when they start to advance their knowledge in this niche. The numbers on prospects, especially when combined with knowledge of scouts, can tell you a lot more than the some of the largest mainstream scouting outlets. In Money Puck’s recent series of posts, he has touched on a proposed “re-tooling on the fly” method to help the Canucks sell off veterans for picks, pick up free agents to replace them, and then use those picks on prospects who could in turn help the Canucks in the future. You might have noticed him talking about PCS, or “Prospect Cohort Success.” In this post, we will look more into what this technique is for analyzing prospects. One of the most popular tools for analyzing prospects is NHL Equivalency (NHLE) numbers, which convert a prospect’s junior Points-Per-Game number to what they would be expected to score if they were to jump to the NHL the next year. These translation numbers change all the time, are updated by hockey stats pioneers like Rob Vollman, and have been cited by nearly every hockey stats blogger at one time or another. NHLEs assume the player will make the jump to the NHL, but that is not often the case. Prospects often play through intermediate leagues and development and opportunities can shape their future as a player. NHLEs are based on a linear regression method which moves all players towards the mean; this rarely happens. NHLEs have to be updated as scoring and talent within leagues changes. This means the NHLE translation factors you would use today for the OHL do not necessarily reflect the same league a decade ago. The issues in the translation factors are even more exaggerated when looking at leagues that are affected by smaller sample sizes. Seventeen year olds, who play in professional leagues in Europe have different roles than top 17 year olds in North America. They are often depth players without special teams time which lowers their scoring relative to their NA peers. But being able to play in a pro league itself is a strong signal that the player is likely to become a regular NHLer. This will not be reflected in NHLEs, as they are not designed to consider talented under-age players in smaller roles. Last, but not least, not all leagues have a translation factor. Sure, ECHLers are unlikely to play in the NHL, but it is still useful to know how their probability of success, as some of them have gone on to the big leagues. To address many of these issues, I’ve been working on a tool called “Prospect Cohort Success” (PCS) with many of my peers here at the Nations Network (thanks to Money Puck, Garret Hohl, and Rhys Jessop for the work they have done so far). While the model is complete, a publicly available and viewable tool is far from finished and is still in Beta. When it is working at an acceptable fashion it may be made open to the public, similarly to the Hockey Projection Project. For now, as we have had many questions on the PCS numbers we’ve cited in past articles and our planned use of PCS is only going to increase as the draft gets closer, it’s important to address the common question of what is PCS and what does it mean? 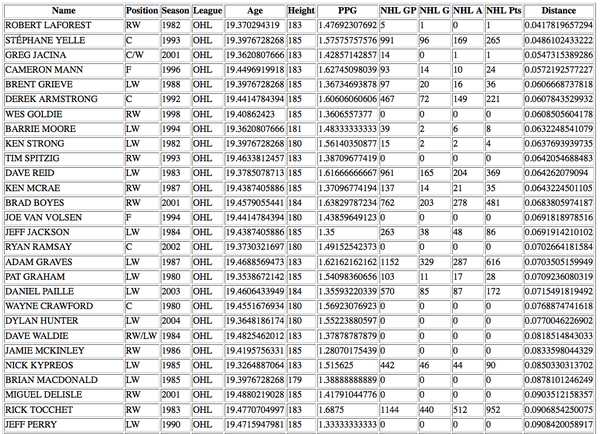 The idea behind PCS is that you can take a player and generate a list of comparable players (aka: “cohorts”). Knowing these comparable players, we can look at their success in other leagues beyond junior to estimate the likelihood of a current prospect becoming an NHLer, and what kind of player they could become. We currently are using three main attributes which we have found to be predictive of a prospects success: age, scoring rate, and height. Height is a bit of a chicken and the egg scenario as typically prospects who are bigger are given more chances to play in the NHL and attract more attention at the draft, but they also have higher success rates. If size bias exists in amateur scouting, it likely persists equally so with pro-scouting, general managers, and coaching. Weight has not been found useful, most likely as it can easily change drastically up or down over a prospect’s development. While the PCS method is league agnostic and could be used for European or AHL depth players, currently, the definition of future success is players in the NHL who have played a minimum of 200 games. The 200 game mark is used as the minimum for “NHL success” based on previous work by TSN’s Scott Cullen. The number of players in the cohort who have reached the 200 game threshold determine the percentage of cohorts who have succeeded, or the Player Cohort Success percentage (PCS%) of the player. Additionally, looking at the NHL points per game average of these cohorts will give you their PCS points per game – a ballpark estimate of how effective comparable players became at the NHL level. What these values tell us is that we can look at a prospect of any age and in any league, and estimate their likelihood of graduating to the NHL as well as their most likely level of production as a player. One of the main applications of PCS is to look at the PCS% of draft eligible players to see how likely they are to succeed based on how their cohorts have succeeded. This can be viewed as a good handle of how “safe” a draft selection is. Another use is to see how the development of a prospect is moving. Connor McDavid is a special case because he is legitimately a generational talent. He has been so good at such a young age it becomes difficult to find talent similar to him. Those who are similar have all gone on to play in the NHL and you have definitely heard of them. It’s also good to see that his ceiling continues to grow. Tyler Johnson is a player that has become much talked about these playoffs. He is playing a key role with the Tampa Bay Lighting and despite nearly scoring a point a game, he went undrafted as you may have heard. When looking back to his WHL career (ages 17-20), it is clear that Johnson was not statistically likely to become an NHL regular due to the lack of scoring and his size. The numbers agreed with the scouts – but both were wrong as he was a clear outlier of player development. 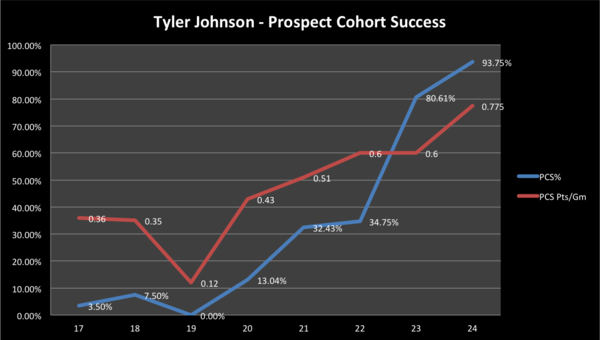 Tyler Johnson shows how development and luck/opportunities are important in making the final jump to the big leagues. An additional point to note is every time the PCS percentage jumps we call that a “graduation bump” – where a prospect who moves to an even tougher league (e.g. from CHL to the AHL), it means they’re more likely to become an NHL regular as professional hockey management and coaches have determined they are worthy of a roster spot. Scoring only adds to their likelihood of graduating. This has been your introduction to Prospect Cohort Success – a tool we are still working on to help identify prospect success rates and ceilings. There is still much work to do with the large amount of data we have. Our future work in the near term is to look at era-adjusting every league to compare the adjusted numbers vs. raw scoring rates. Additionally we are going to include more features such as Quality of Teammates (i.e. with Goals Created) and maybe through other features such as PIMs (which Ian Fyffe found to be a predictor of success). If this area interests you, we welcome and encourage any feedback! Ambitious, meaningful off-season post. Appreciate how you threw Johnson in there to demonstrate that exceptions exist with every model. Good stuff. This is the best and most convincing explanation I’ve seen so far of the use of the size variable — here you make it clear why even if success may be intensified by the bias towards taller players by the hockey establishment, it doesn’t diminish the overall point that it remains a predictor of success at the benchmark of games played (not necessarily quality of that play). 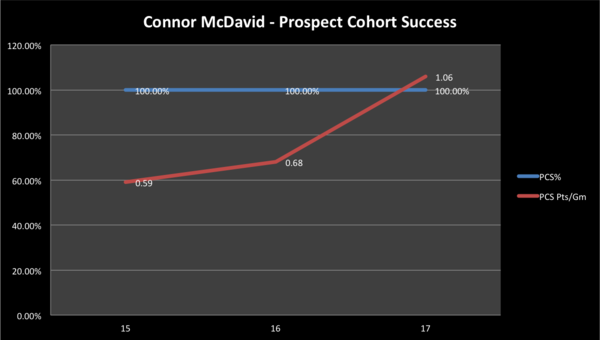 The cohort model you’ve developed seems like a much more convincing and rigorous version of something that we already tend to hear anecdotally in scouting reports, that prospect x resembles NHL player y and yet that is often based on little more than gut feelings. Good luck with this and looking forward to seeing the full working model. Something that jumps out to me is that all of the cohorts you have listed for Cassels are from 2004 or earlier. 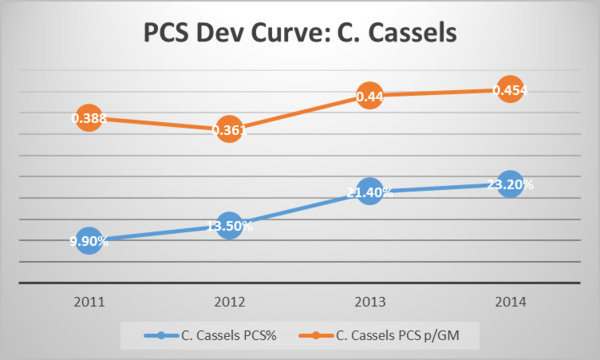 Maybe I am missing something obvious, but all the cohorts you have listed for Cassels are at least a decade old, so why is it valid to use pts/gm across eras in this case but not in the NHLE case? Nice work on this post. Clear and informative for us non-stats guys. i’m not a stat guy by any means but this looks good. really good. i predict you will all become rich and famous. i’d be curious to see a comparative chart without the height factor. This is a moreare a more balanced post regarding statistical analysis, as there are factors that are impossible to model(at least for now) such as luck, development support, etc….. Kudos guys. As you pointed out there are always outliers from both sides of the spectrum. The Tyler Johnsons and the Connor McDavids. But there are others at the other end too such as the Alexandre Daigles of the world. I know that we always talk about sample sizes, but sometimes they also bring these outsiders into the mix that skew the average. Ideaaly it should be balanced and cancel each other, but reality sometimes doesn’t follow logic..
You are moving in the right direction, acknowledging the short comings, and going back again to revisit the assumptions, etc…. Really cool stuff guys, with each article I become more worried that you guys are going to get snapped up by a pro scouting department before you finish this series of articles. Seriously though, I’m enjoying this next level look at prospect potential, it must be a ton of work, well done! This methodology seems somewhat similar to the Viper(?… Vapor? something like that?) method. Which is a reasonable approach, but I’d expect this model to fall victim to the same kind of long-term trends that scoring-based methods do. For example, if more young high-end prospects choose the college route, or if young guys start getting less and less opportunities in the European elite leagues, it would still skew the probability of making the NHL for a kid playing in those leagues today. Just as surely as increase or a decrease in scoring in those leagues would skew a point-production-based model.